In 2013, the complete breeding cycle of the Indian Grey Hornbill was captured and recorded on camera in the Forest Department Biodiversity Nursery at Indore. 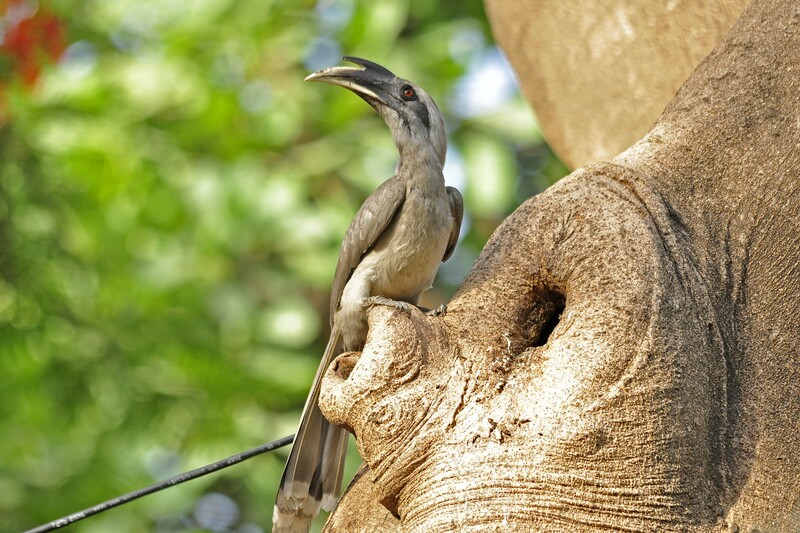 The Indian Grey Hornbill, as its name suggests, is a grey-coloured bird, locally known as Dhanesh Pakshi. Like other members of its family, the bird has a unique casque (or horn) on its bill. It is common across the subcontinent, especially in areas where there are large and continuous tracts of trees. 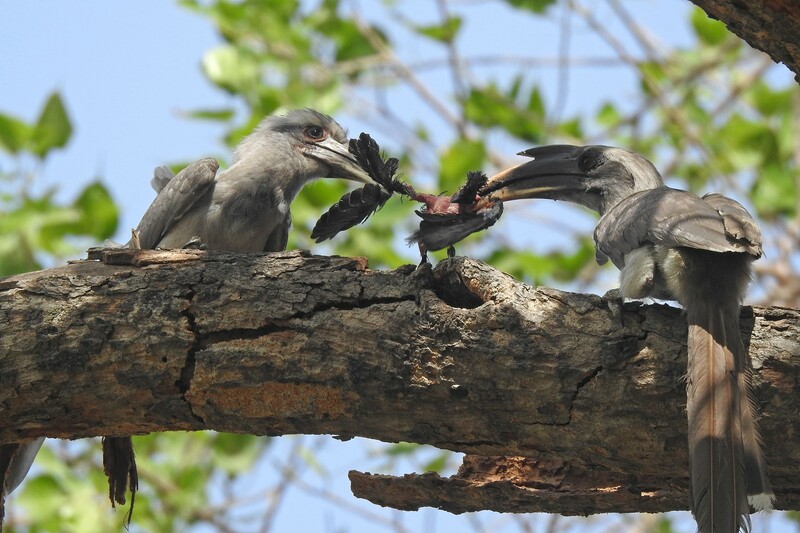 In 2013, I had the opportunity to study the breeding behaviour of the Indian Grey Hornbill for the duration of its breeding season, from March to June. I used to watch the same hornbill pair every year at the nest located inside the forest department biodiversity nursery at Indore – that’s where, round the year, different species of plants are grown to be later planted by the forest department in degraded forest patches. That year, the then-Chief Conservator of Forests, Indore, Dr PC Dube, suggested I film and record my observations. On his advice, I set up a web camera near the nest and started recording the breeding behaviour of the birds, in the first ever documentation project of this kind in India. Funded by the ecotourism board, I mounted the camera at a safe distance of around 5m from the nest, by soldering a rod onto an existing steel structure there. The live footage went straight to a computer at the nearby forest officer’s residence. These birds use natural cavities or coaters (naturally formed holes) in tall trees such as Gulmohar, Neem, Peepal, Banyan or Jamun to nest. In this way, I recorded the complete breeding cycle of the Grey Hornbill through a CCTV. At the end of the documentation project, I had more than 900 hours of footage over three months, from which many interesting observations were to come to light. The Indian Grey Hornbill, known to be monogamous, begins to display courtship behaviour in January, with the male offering the female different food items to woo her. Their breeding season commences in March. To nest, these birds use natural cavities or coaters (naturally formed holes) in tall trees such as Gulmohar, Neem, Peepal, Banyan or Jamun. I saw the female hornbill enter the coater of the tree and seal its entry with her own excreta and mud provided by the male. She would remain inside for around two to two and half months, leaving only a small, vertical crack in the opening, around 2-3cm wide and 7-8cm long. Just try to imagine it: an independent, free-flying bird sentencing herself to a two-month confinement. The female hornbill answers the call of motherhood by sacrificing so much. Once inside the nest, the female lays 2-3 milky white eggs and incubates them for around 20-25 days. During the incubation period, she shed her flight wings and depended totally on the male for all her food requirements. The CCTV recorded her dropping her feathers from the nest. While studying the camera footage, I also noticed how at times, she inverted herself inside the nest and threw her faeces out of the tiny crack, so as to maintain the nest sanitation. With his mate safely ensconced in the nest, the male hornbill had to forage for long distances to collect the food. The hornbill diet mostly consists of figs, the fruits of Jamun, Neem, Bargad or Banyan, Peepal and Gular, or ficus, and luckily for these hornbills, the nest was well located near plenty of large fruiting trees. 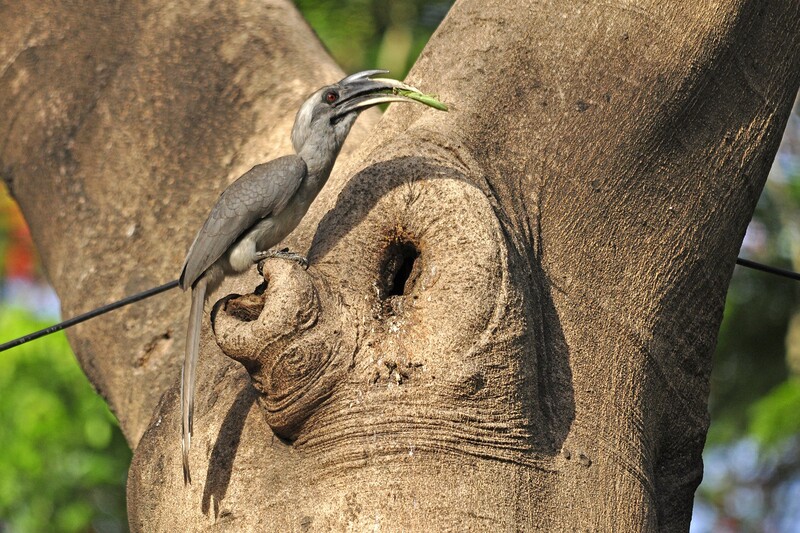 An adult male Grey Hornbill regurgitates fruits to feed the female and the chicks inside the nest. The male would hold the fruits in his throat, and regurgitate them one by one to feed his partner in the nest. Many times he would also bring her insects as well. I observed that in a single day he would ferry 125-160 food items (around 5-10 tidbits each time) in around 20-25 trips to the nest, from 5.30am to 7.30pm. For the first time, it was observed that the hornbill also feeds on chapattis and sweets – certainly a surprise to us. I noticed this pair feeding on manmade food items in addition to their typical diet. These chapattis were picked up near the forest officer’s residence, where they had been left out for squirrels in the vicinity. It appears that Hornbills have started adapting to urban environments, where fruit-bearing trees have dwindled in number, due to the felling of trees for housing and infrastructure, and sometimes, due to the vagaries of climate, fruit either earlier or later than usual. In a single day, the male would make around 20-25 trips to the nest to ferry around 120-165 items, from 5.30am to 7.30pm. As soon the chicks hatched, their calls for food could be heard and the father increased the supply of food to cater to the chicks’ insatiable appetites too. When they were about one-and-a-half-months old, roughly half the size of their parents, the space inside the nest began to become congested. It was time for the mother to emerge from the coater. I watched her break the wall and try to get out of her self-confined prison. But since the cavity hole had narrowed further due to some hardened mud pieces, her escape was very painful. It was excruciating to observe the mother haul her wings to wriggle out of her tiny house. This is the most vulnerable time in the life of the female. She was stuck at the mouth of the cavity for almost 15 minutes, and it seemed as if she wouldn’t be able to come out, when she finally gave it all her effort, and at last, managed to emerge from the nest. Now, with their mother absent from the nest, the chicks had to fend for themselves. Immediately, they got down to business. They got to work building exactly the same kind of wall their mother had, using fruit pulp, a little bit of mud that remained inside the nest and their own sticky droppings. It was incredible to see. No one taught them how to do it; it is nature’s way to let them learn by themselves. It took a lot of time and effort for the chicks to prepare the wall. The male and female kept watch on their activities perched on nearby branches. The mother is seen luring the chick with food to encourage it to come out of the nest. The young ones grew fast and chirped loudly on their parent’s arrival. I could see they were beginning to understand and respond to the world around them. The father came to the nest and fed them every few hours, so the chicks would feel safe under his tutelage. After coming out of the nest, the female hornbill assumed some of the responsibility as well, but the major task of feeding still rested with the male. Both would forage in a radius of around kilometre or so, and bring a choice of figs from nearby trees for the chicks – their nesting period coincides with the fruiting period of these trees. The chicks were also fed with grasshoppers and other insects – rich sources of protein that help them to grow faster. The chicks continued to grow. The small crack in the tree was to be their sole source of air, light and food for the chicks for 2-3 weeks more, until they fledged out. Once confident, they start peeping out from the hole, trying to understand the outer world which they are supposed to venture out into soon. When the right time came, the female lured the chicks with food to motivate them to fly. These tiny babies by now were clearly restless to emerge from the nest with their new flight wings. While watching, I imagined that for this hornbill couple, the moment would be akin to how we humans feel on seeing our child take his or her first few staggering steps. Although hornbills are usually frugivorous, during the breeding season their diet also includes more protein-rich sources like insects and even smaller birds. The larger of the two chicks, clearly better-fed and more confident of his flight feathers, emerged first. It flew easily to the nearby branch from where the parents were calling , while the second chick, who seemed to be slightly weaker, also emerged on the same day, but was not able to fly up to the nearest branch. It fell on the ground, and it took enormous effort (and regular encouragement from its parents) for it to fly to a safe nearby place. As soon as the chicks were successful, they were fed by both parents in the nearby canopy – a heartwarming sight. What struck me as I watched this footage was the female hornbill’s complete trust in her spouse, and the male hornbill’s utter devotion to his duty. The hardworking male kept gathering and supplying food for his family every day – becoming weak as a result of these strenuous efforts. For any reason, if he had been unable to do so, the future of his mate and chicks would have been jeopardised. It was clear to me that together, both parents made sacrifices to fulfill their roles. In this way, they gave the next generation the gift of flight, and granted them the limitless expanse of the blue sky. Come next year, the same pair would reunite, and use the nest once again to rear the next set of chicks.